Yesterday was a crazy travel day! I’m in Salt Lake City for the Build Your Blog Conference hosted by the sisters of Six Sister’s Stuff this weekend and I couldn’t be more excited! Getting here was not easy though! I had a flight delayed, which was going to make me miss my connection. So I changed flights and decided to go through Philadelphia rather than Houston, TX. I figured if I was potentially going to get stranded somewhere, Philly would be best since my mom just happens to be working there this week. And now that I’m in SLC I can’t wait for today to get going! It’s my first in-person blog conference and I can’t wait to meet so many of my favorite bloggers and soak it all in. I meant to get this post up and ready to go before I left, but this week has just been crazy. But I couldn’t wait until next week to post this recipe! 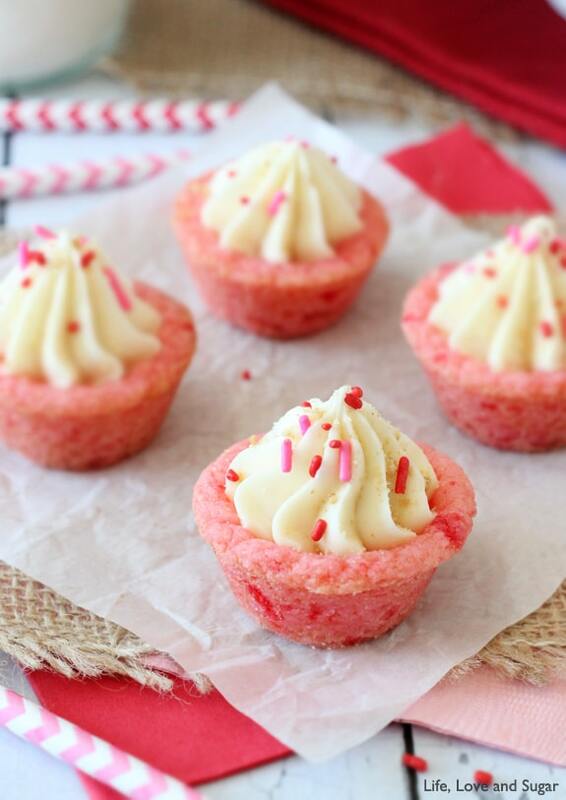 It’s so tasty and with Valentine’s Day right around the corner, these cookie cups are perfect! Plus, I have a couple friends waiting for the recipe. These are that good. I actually made these last week and took them to our small group Super Bowl party – because every football party needs pretty, pink cookies. Duh. Despite their pink, non-manly color, everyone loved them. They didn’t last until half time and a number of the girls from group are already planning on making them themselves. That’s what you call a slam dunk! At least as far as a recipe goes. 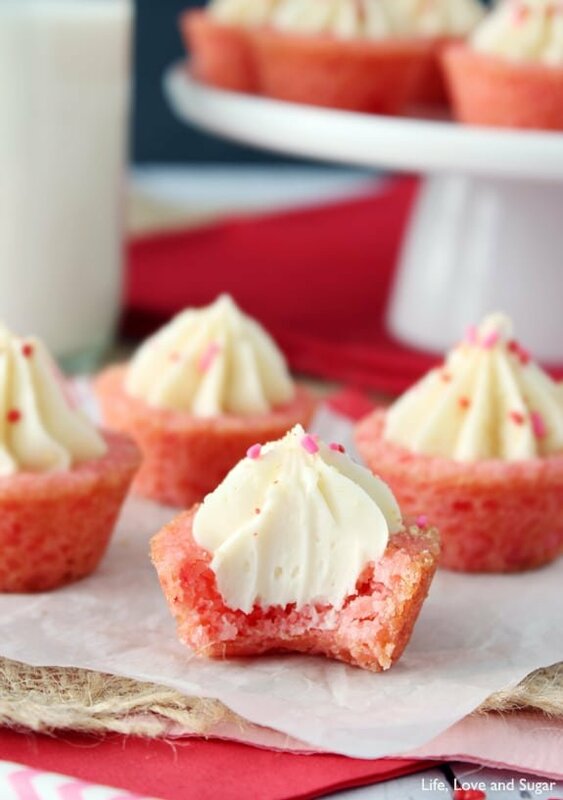 One of the great things about these Strawberry Cheesecake Cookie Cups is how nice and easy they are to make. 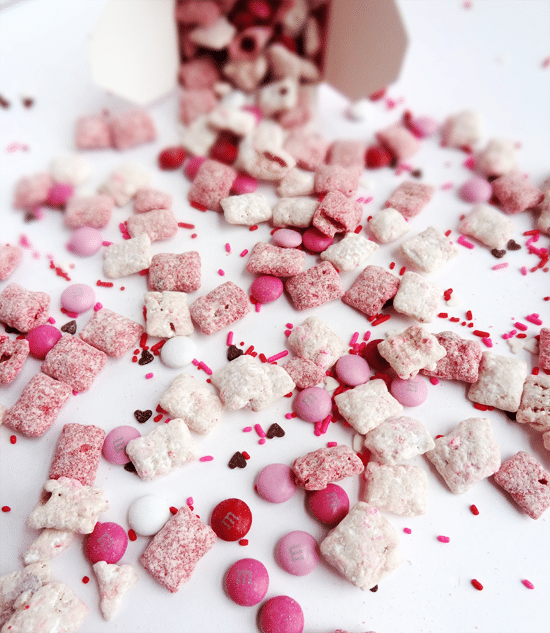 They start with a strawberry cake mix – the ultimate in easy. Growing up, my second favorite box cake behind funfetti was strawberry. 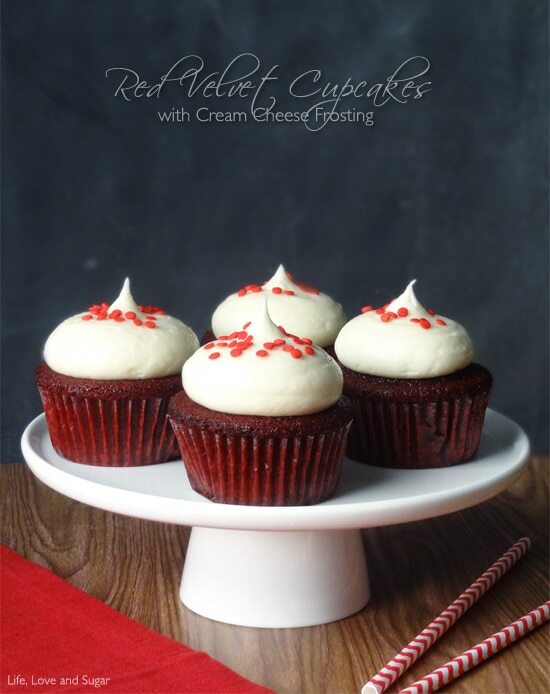 I always paired it with cream cheese icing – yummy! That childhood fave inspired these cups, but instead of stopping at cream cheese icing, I went with an incredibly easy and delicious no-bake cheesecake filling. The cookies are moist and chewy and are perfectly balanced by the cheesecake. The cheesecake is just sweet enough and doesn’t overwhelm the cookie. You get the perfect amount of strawberry cookie and cheesecake in each bite! The only thing to be careful of when making these is how much dough you put into each mini muffin. You only want to fill them about 3/4 full. Any more than that and they will overflow when baked. Once they’re baked and cooled, you can spoon in, or pipe, the cheesecake filling. I put a little graham crackers crumbs and sprinkles on top, but of course that’s optional. 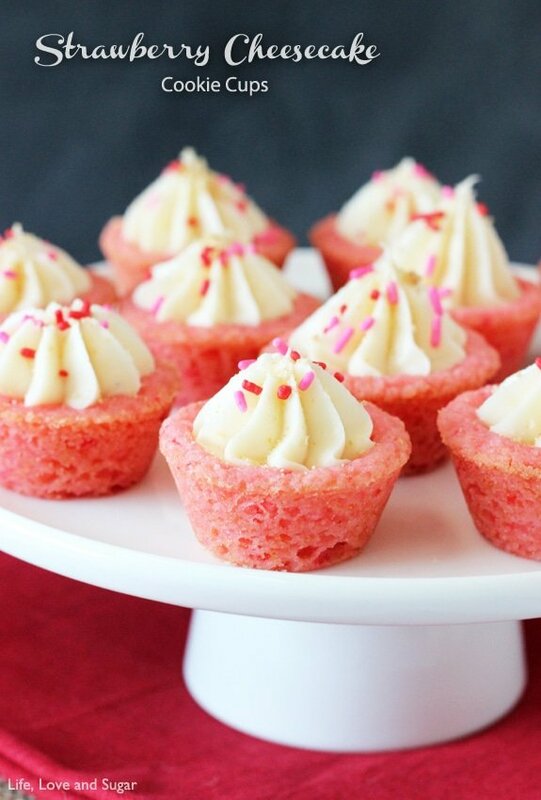 These cookie cups may be simple but don’t let that fool you – they are awesome! Happy baking! 2. Add egg and milk and mix until combined. 3. Add dry cake cake and mix thoroughly. Dough will be thick. 4. Wrap dough in clear wrap and refrigerate 3-4 hours, or overnight. 6. Make balls of about 1 1/2 tsp in size and press into the bottom of each mini muffin cup. Press the center down just a bit to make a slight indention, where you’ll add the cheesecake filling later. You want each cup to only be about 3/4 full, or they will rise out of the cup when baked. 7. Bake at 350 degrees for 9-11 minutes, or until edges are barely golden. 8. Remove cookies from oven and allow to cool for 3-4 minutes. If the center doesn’t still have an indention, use the end of a wooden spoon (or something similar) to press down a bit in the center of each cookie. 8. 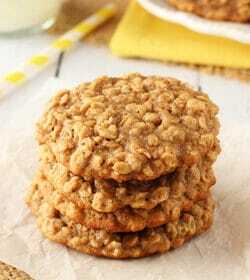 Remove cookies to a cooling rack to cool. 2. Add powdered sugar and vanilla extract and beat until smooth. 3. 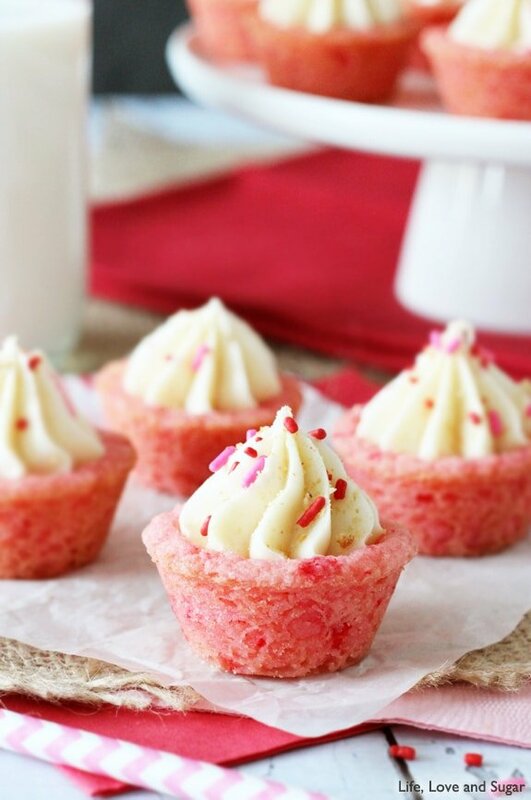 Use a spoon or piping bag and tip to add cheesecake filling to the center of the cooled cookie cups. 4. Top with graham cracker crumbs or sprinkles, if desired. Store covered in refrigerator. Love these! Easy and adorable! Thanks! Good for you bringing some pink to the Superbowl haha. Although, even though these are adorable and girly I’m sure you’d be hard pressed to find someone of either gender who wouldn’t enjoy them! These Cookie Cups are awesome! I am SO GLAD you made in to SLC! These cookie cups are just too much fun Lindsay! So glad we had the opportunity to connect at BYBC 🙂 You are just as awesome as I knew you would be. Pinned! Just made these for Vday. SO cute & easy! Thank you! Yay! I’m so glad you like them! Happy Valentine’s Day! Thanks Renee! I think they’re great for spring too – anytime really! I definitely had fun in SLC – so great to meet you! Those are just too adorable for words! These are so super adorable! I love the colors – perfect for spring! Love these! 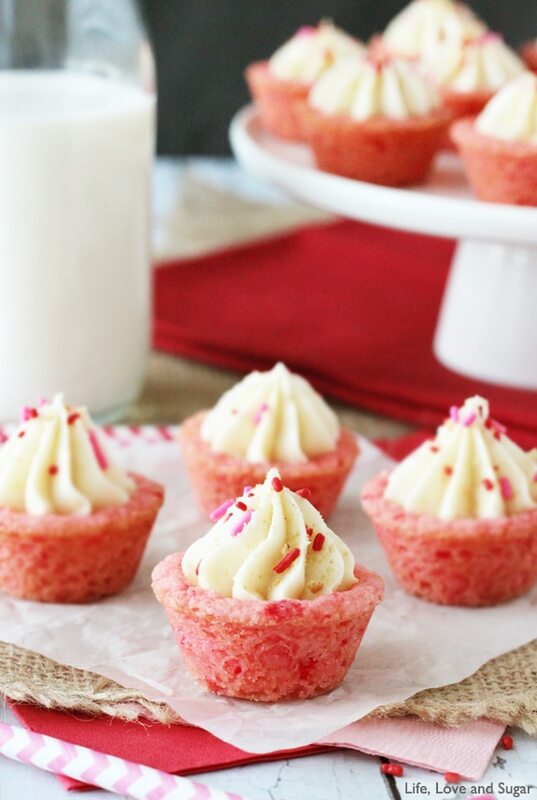 I’m obsessed with anything strawberry and these little cups are the perfect little treat! I just found your blog, and I am absolutely in love! These look so cute and delicious. I, too, just found your website and my mouth is drooling. Everything you make looks soooo delicious & scrumptious – gotta try these and some others you have posted. Many thanks for your talents and sharing. Yum! Yum! Thank you for sharing your recipe! These look adorable and delicious! 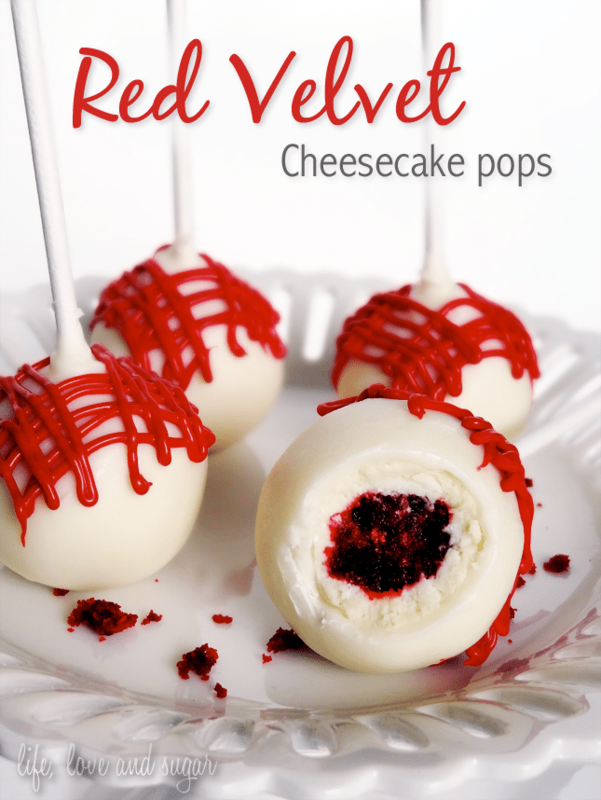 I am making them for a bridal shower this weekend. How far ahead can they be filled? These will be perfect for a shower! It’d probably be best to fill them the day you want to serve them, just so the cheesecake filling stays fresh. However, I made them and had them in the fridge for 2-3 days and they were still delicious – the filling just firms up a little as it sits in the fridge. I’m in the process of making my first batch of these now. I can’t wait to try them. Would it be okay if I make the cheesecake filling and let it sit overnight as well? I’ll be making more of these for my sister in law’s baby shower next week. Sorry for the late reply. Yes, you can make the filling and let them sit overnight, just be sure to cover and refrigerate them. Thank you for the update. These were a hit at the baby shower! I’ll be making them for another shower in a couple of weeks. 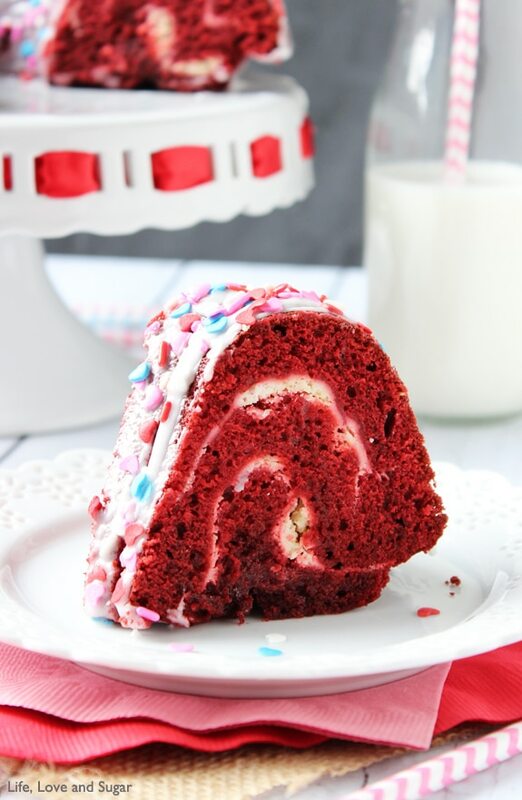 Can I use this same recipe but switch the cake mix? 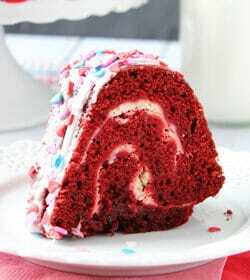 I want to try red and blue velvet cake mix for my next shower. Would like to know if these can be frozen after they are made. They should be fine frozen in a sealed container for a week or so. Goodness, these looks so tasty! 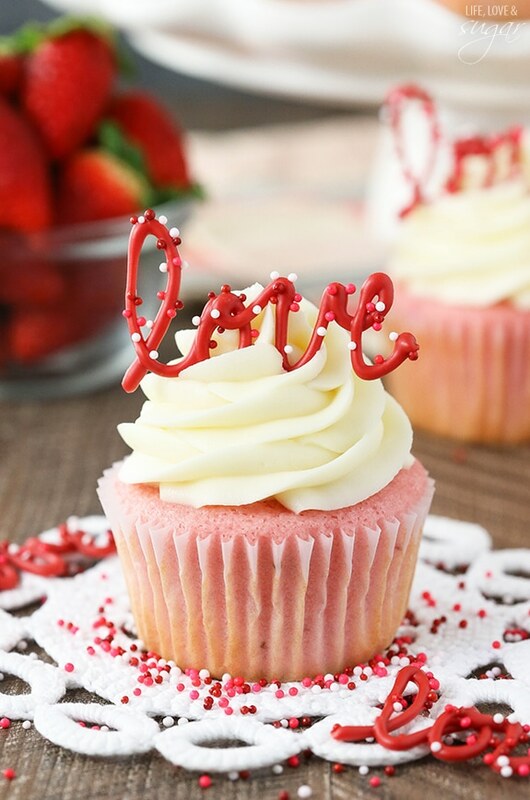 Is it possible to substitute the strawberry cake mix with a different flavor? Chocolate, carrot cake, and Red velvet seem like they would be fun alternatives. Yes, any cake mix should work. Both work fine for this. Yes, they should be room temperature. 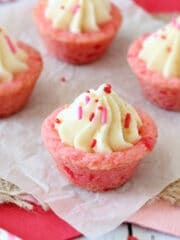 These mini strawberry cheesecake cookies look pretty in the picture but this recipe is terrible. Great idea though. Tastes great, but I haven’t been able to make it work either. They rise up, then collapse… I’ve gotten wonderful chewy bottoms, but only when sides were crispy.. they aren’t cooked in 9-11…what am I doing wrong? I’m not sure. It’s been a very long time since I made these. I’d have to try them out again and see. I don’t remember having an issue though.